In 2005, areas under nature protection including Natura 2000 network of areas and protected areas (national park, regional park, landscape park, strict nature reserve, natural reserve and natural monument), represented 39.7 % of the territory of Slovenia, which is almost six times more than in 1992. Forests cover 70.0 % of areas under nature protection, and agricultural land covers 20.2 %. 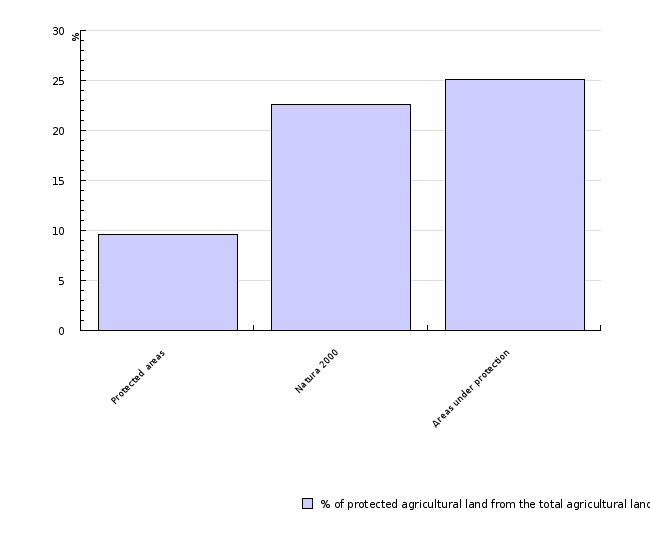 In 2005, 26.0 % of agricultural land was included in different forms of protection. Slovenia has 375,569 ha of agricultural habitats, which could be ranked among agricultural habitats of special importance (permanent grassland, extensive meadows, bog meadows, meadow orchards) by the Habitats Directive. Just under a third (29.1 %) of these habitats are located in protected areas. The Natura 2000 sites include about 13 % of agricultural habitats of special importance. Their conservation depends on the conservation of extensive agriculture. The indicator presents the areas under natural protection in Slovenia and their share in the total surface area of the country. They include the Natura 2000 network of areas and protected areas such as parks, reserves and natural monuments. We presented the types of land use in the protected areas. The role of agriculture in the preservation of biodiversity is presented by the share of agricultural land in the total protected areas and by the share of protected areas the preservation of which depends on extensive and environmentally friendly farming methods (permanent grassland, extensive meadows, bog meadows and meadow orchards). The indicator thus presents the surface area of protected areas, but does not provide direct information on the achievement of a favourable state of wild plant and animal species, their habitats and habitat types on these areas. The Habitats Directive (Council Directive 92/43/EEC) is the legal framework for the Natura 2000 Ecological Network, defining Proposed Sites of Community Interest (pSCI). The Natura 2000 Ecological Network also includes Special Protection Areas (SPA) defined by the Bird Directive (Council Directive 79/409/EEC). When Slovenia entered the EU, the Directive on Special Protection Areas (Nature 2000 sites) (Official Gazette RS No. 49/04) defined Natura 2000 areas and protection goals in Slovenia as well. Areas under nature protection (national park, regional park, landscape park, strict natural reserve, natural reserve and natural monument) are protected by the national and municipal acts. These areas are ranked in accordance with the International Union for the Conservation of Nature (IUCN) categories and do not entirely overlap with the Natura 2000 sites. They occupy a smaller area and have a higher organisation level with elaborate management plans and assigned managers. Individual parks are presented in the Areas under natural protection indicator in the Nature and Land Use chapter. Environmental Agency of the Republic of Slovenia (EARS), 2007. The goal of the National Environmental Protection Programme (1999) is to find different ways to protect 30 % of the territory of the Republic of Slovenia by 2008. The Habitats Directive (Council Directive 92/43/EEC) defining the Natura 2000 European Ecological Area plays a key role in the protection of biodiversity. The goal of the Directive is to maintain and restore the favourable state of habitat types, and to ensure the conservation of plant and animal species. Due to different natural conditions and preserved state of nature, the definition is flexible enough to allow for various interpretations of the Directive among the EU countries. The goals of the Resolution on National Environmental Action Plan 2005–2012 (2006) emphasise the need to establish or provide management of the protected areas and introduce a uniform management system. Up to 2004, areas of special value in Slovenia were protected in the framework of the areas under natural protection (national park, regional park, landscape park, strict natural reserve, natural reserve and natural monument). In 2005, 2,866 km2 or 14.1 % of the entire territory of Slovenia was protected. An important share of these areas is located in the Triglav National Park, and in the last few years, the protected area has increased mostly due to the designation of two major parks (Notranjska Regional Park and Goričko Landscape Park) as protected areas. In 2004, protected areas were joined by the Natura 2000 areas with 7,197 km2 or 35.5 % of the entire territory of the Republic of Slovenia. Protected areas and Natura 2000 Areas partly overlap; in 2005 they represented 39.7 % of Slovenia’s territory, which is almost six times more than in 1992. A predominant part of the areas under natural protection is covered by forests (70.0 %), followed by agricultural land with 20.2 %. In comparison with other European countries, Slovenia has a large share of land in the Natura 2000 area. In accordance with the Habitats Directive and Bird Directive, Slovenia protects a share of its territory about 2.7 times larger then the EU-25 countries. A large share of protected areas originates in the environmentally relatively friendly land use, indicated in large shares of wooded areas and grassland in the structure of agricultural land. Considerably large areas of partly vegetated or barren land above the forest line, too, contribute to this share. 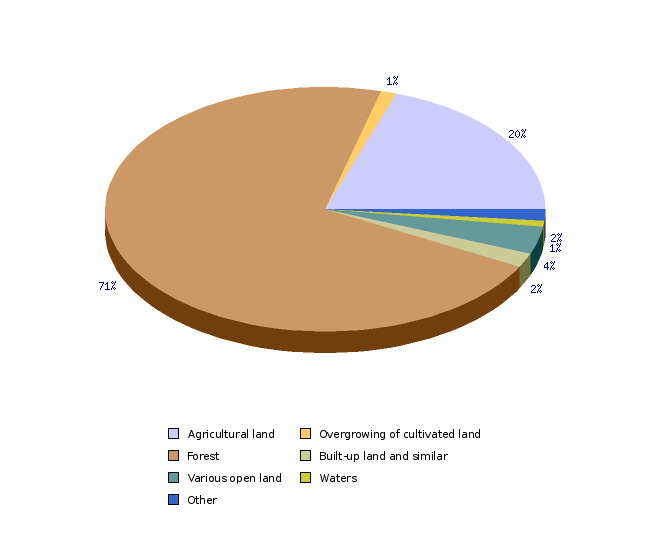 In 2005, agricultural land occupied 162.735 ha of protected areas. This means that 26.0 % of agricultural land in the country is included into various forms of protection. Agriculture plays an important role in special agricultural habitats, the preservation of which, according to Habitats Directive, depends on continued extensive farming. The map of habitat types for Slovenia has not yet been produced and since this is an important (elementary) indicator of the preservation of habitats, we have assessed the habitats of special importance in terms of the area of land use categories: permanent grassland, extensive meadows, bog meadows and meadow orchards. Slovenia has 375,569 ha of such areas, 109,366 ha (29.1 %) of which are located in the protected areas. In the structure of Natura 2000 sites, there are about 13% of special agricultural habitats, which is less than in the EU-15 countries. The main reason for this is the very large share of forests located on the Natura 2000 sites. The preservation of agricultural habitats of special importance depends on the preservation of extensive farming. These habitats are endangered by the abandonment and intensification of agriculture. The formation of protected areas is only the first step, but in practice, these habitats will be preserved only if farmers find economic benefit in them. We acquired information on the protected areas from the Register of Protected Areas. The same areas can simultaneously be included in the protected areas and Natura 2000 sites, thus we always used the data on net areas (without doubling the land included into different protected areas) to calculate relative indicators of individual merged areas. Based on the Land Use, MAFF 2000, we estimated or defined types of land use comparable with the agricultural habitats of special importance defined in Annex 1 of the Habitats Directive. The map of habitat types for Slovenia has not yet been produced so we assessed the indicator on the basis of the surface area of permanent grassland, extensive meadows, bog meadows and meadow orchards. We believe the presented data is reliable enough and comparable with other EU countries. c) Natura 2000 sites – Habitats Directive (pSCI). We rasterised vector polygon layers of PA, SPA and pSCI (EARS) individually into a GIS raster layer into cells with 25 m sides in nature. Due to the extent and precision (more than 570,000 polygons), we rasterised land use on the scale of 1:5.000 (MAFF 2000) into the Arc Info GRID form with a cell side of 25 m. A layer of land use was defined with the method of photointerpretation of digital pictures at the scale of 1:5.000. We used individual layers of SPA, pSCI and protected areas to exclude the overlapping areas. We statistically processed the excluded layers of land use and summarized the areas by individual types of use. We performed logical verification, which included the total areas and on-screen verification of the suitability of locations of the land use layers. We used the ArcInfo (ESRI) programme in the process.